On Saturday 4 July 2015 at 7:30pm the Rushmoor Choir will be performing “A Summer Evening of Song”, a collection of musical postcards to sit back and relax to on a summer evening. All of the pieces were chosen by members of the choir and all are pieces by British composers or about Britain. The choir will be performing Elgar’s “From the Bavarian Highlands”, his setting of Bavarian folk songs, and there will be a choral selection from Lerner and Loewe’s “My Fair Lady”. Other items will include choral settings of Scottish and Irish folk songs – and perhaps the odd surprise item to send you on your way with a smile. 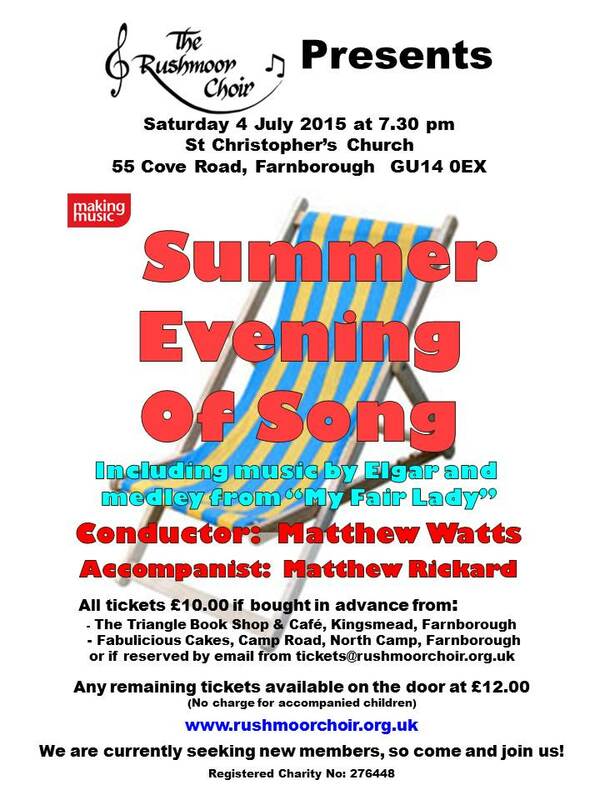 Matthew Watts will be conducting the choir and Matthew Rickard will provide the accompaniment.